I am a New Media Management graduate student at Newhouse and I have found my favorite class of the semester. Professor Masiclat (Masiclat) has broken the normal graduate classroom mold with his Applied Research in Content Management class. A normal university class involves every student doing the same homework, same readings and same exams. This class is much different because it is made up of two different types of students that have different class objectives: New Media Management (NMM) & Magazine, Newspaper and Online Journalism (MNO). Masiclat has developed a curriculum that revolves around an online newsite he created called Liveable CNY. 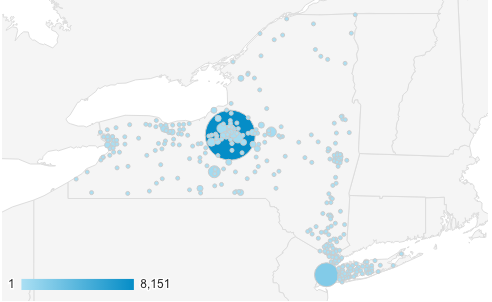 This site is a place where people inside and outside the Central New York (CNY) community can learn about all the great things CNY has to offer. The main topics covered are: Civics, Commerce, Communities, Connections and Culture. In an effort to build a real life, new media company example, the graduate students are broken into teams with a combination of MNO and NMM members. The job of the MNO students is to write the articles and provide editorial control. The job of the NMM students is to take those articles and build out a search engine optimization (SEO) plan to maximize their reach. 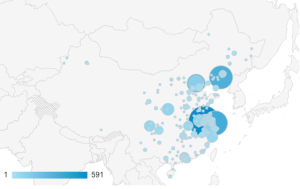 The following two Google Analytics graphics (New York and China respectively) show two examples where people have come to the Livable CNY site from. This class is having an impact. Not only is Livable CNY becoming a great resource for people in New York, it is becoming extremely useful for people outside the United States. Many graduate students in my program come from countries like China and India. Students from these countries can learn valuable insights into why the CNY community is a great place to go to school, where to live and where to find a job post graduation. We have big plans for the site over the next semester. I hope you check it out and learn something new about the CNY community. I am glad to find so many helpful information right here in the post, we need develop extra techniques on this regard, thank you for sharing. pleasant. So much great information on here :D.